David Spurlock began his piping career at the age of 15 in Rockville, Maryland. As one of the founding members of his high school pipe band, he became its Pipe Major in his junior year. David owes his piping expertise to his early tutors: Dr. Richard Scott Blair, Sandy Jones, Bill Logan, and Frank Early. All were, and still are, notable figures in the piping community. 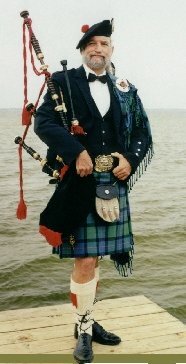 In 1994, he came to Brevard County, FL and joined The Oceanside Pipes and Drums. In 1997, he became the band’s Pipe Major and changed the name of the band to The City of Melbourne Pipes and Drums. 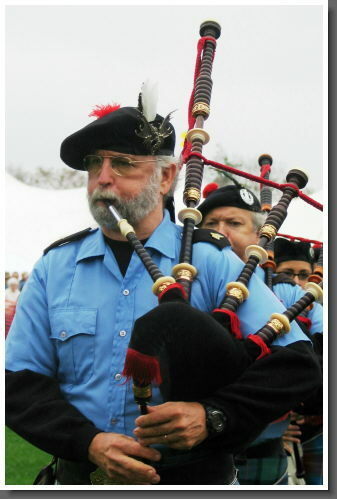 David is an avid competitor in Highland Games’ piping competitions and consistently garners top awards. He is available for a wide range of piping services throughout Brevard and neighboring Counties. They include weddings, funerals, special events, parties, etc. David Spurlock and nephew David Ridgway enjoy a relaxing brew after a busy day at The Brass Dragon. 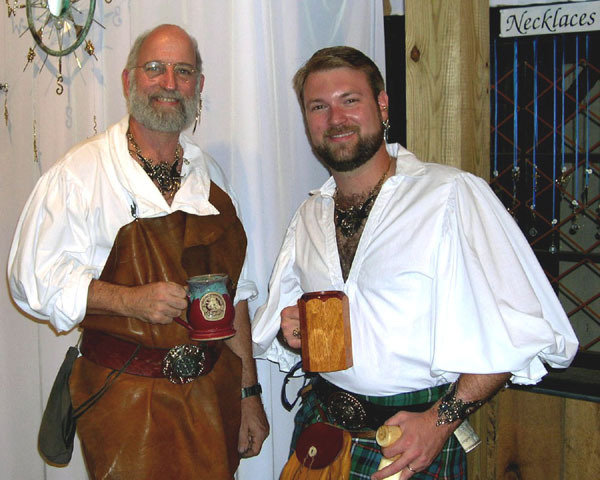 They both sport dragon necklaces, custom belt buckles, sword earcuffs, and David Ridgway wears his matching dragon cuff bracelet. Artist and Owner of The Brass Dragon, David Spurlock is also renowned for his expertise in bag piping. He may be seen performing (at special request) at the Maryland Renaissance Festival Grounds. His band, The City of Melbourne Pipes and Drums, perform throughout Florida during the winter and spring months each year. Read his "bio" to the right.